YouTube is the world’s second largest search engine processing more than 3 billion searches a month. According to Mushroom Networks, YouTube reaches more adults in the United States ages 18-34 than any cable network. This dynamic ability to be one of the largest search engines while also being viewed as a video content provider by one of the most sought-after audiences, makes YouTube a very attractive option for digital advertisements. But what YouTube ad types work best for your brand and digital marketing strategy as a whole? There are a variety of advertisement options that a business can utilize through Google AdWords but we are going to break down the options into four different types of ads: display, videos, sponsored cards, and discovery. 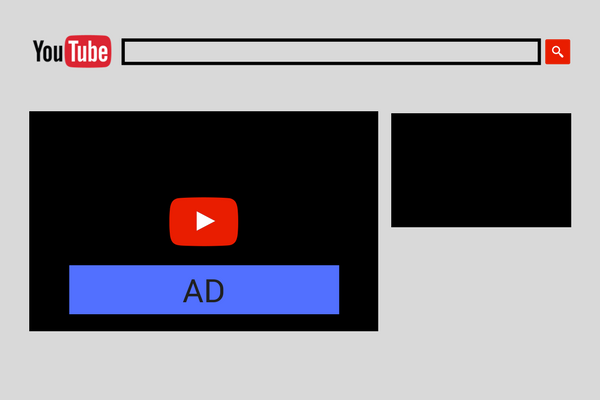 Below is a breakdown of YouTube ad types with examples and costs associated. Display advertisements are a YouTube ad type that can be broken down into two options within YouTube: display and overlay. Both options are only available on desktop viewing. 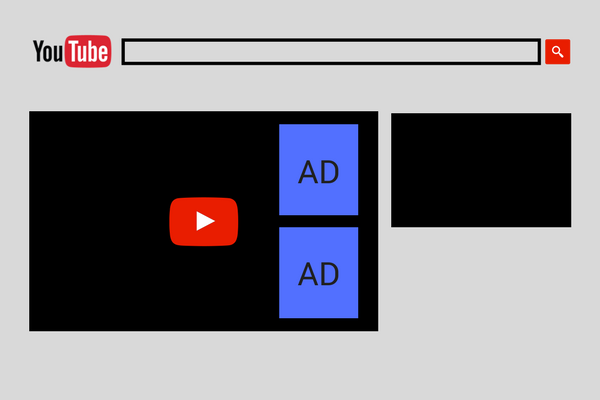 A true display ad for YouTube is in the display box area to the right of or below the video player depending on screen size. Very similar to an AdWord Display campaign, you only pay for clicks on the display ad and can target placement based upon keyword searches and specific video channels. For example, if you were selling a carpet cleaning product, you might want to target searches such as “carpet cleaning tips” and “carpet cleaning diy” while also placing the ad on your YouTube channel. This gives your display ad the most relevance to your target audience. For additional tips on ad targeting, our AdWords guide is a great resource. An overlay ad is a semi-transparent box that is on top of the lower 20% of the video player. The ad can contain an image, text, or both. An overlay ad can follow the same targeting as a display ad and again is only charged if a user clicks on your ad. An overlay ad is a great way to provide a call-to-action on your own videos for users to take a next step to your website or direct traffic to an applicable resource. Most people think of video ads when they think of a YouTube ad which makes sense given the platform. However, there are different types of video ads that an advertiser can use based upon their goal: skippable, non-skippable, and bumper ads. All three options are available on desktop and mobile in the video player with only skippable being also offered on TV and game consoles. 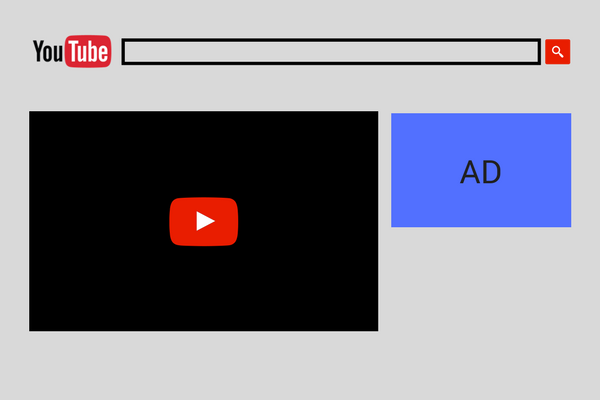 This is currently the most common ad format for YouTube advertisements with viewers being able to skip over your video after 5 seconds of viewing. It is popular for good reason: this is the only advertisement option that is available on any device and you are only charged when the viewer gets to 30 seconds or watches the entire ad (whichever comes first). The advertisement can play at the beginning, middle, or end of the video. This is a great option is you have a quickly engaging video ad or messaging that users will want to watch in it’s entirety. Just as it sounds, these video ads must be fully viewed by the user. The user does not have the option to pass over the video, therefore you are charged for each view. The video must be at least 15 seconds long and can still be inserted in the beginning, middle, or end of a video. Although the non-skippable video ad sounds like a great options since viewers must see your content, you are not able to really gauge engagement as they must view the whole video. This is also one of the most expensive options are you are paying for each view. Sponsored cards are perfect for an eCommerce company by putting the relevant product or products in the video easily accessible as an overlay on the right side of the video player. If we go back to the carpet cleaner example, you could have your carpet cleaning products used in your video as sponsored cards within the video. A viewer can easily click on the product and be directed right to the online store to purchase the product. The sponsored product cards can be seen on desktop and mobile devices and the actual card sizes vary. Although this ad size is relatively new, this has become a very popular option for eCommerce advertisers as it is a convenient click-to-purchase option. Discovery advertisements or “TrueView” ads run across both YouTube and Google Display Network as suggested videos. For example, in YouTube they can be found on the search results and watch pages in both desktop and mobile viewing options. The ad consists of an image thumbnail as well as up to three lines of text. If a user clicks on the ad, they are then directed to the full video hosted on YouTube or the channel page. This is one of YouTube’s newest advertising movements and is getting a lot of traction, specifically with advertisers who have solid videos or channels already on the platform. The goal of the ads are to bring traffic and views to your specific video or channel by targeting similar videos or channel audiences. With the ad type being newer and somewhat more organic looking, users are seeing great results. It is also advised to have an overlay on the video to take people through the next step of the advertising funnel most likely to a website. As you can see, there are many possibilities when choosing YouTube ad types that are right for your business. Creating a strategy that combines these different YouTube ad types will ensure that you reach your audience in a variety of ways. This will increase the overall effectiveness of your YouTube campaign. Are organic leads no longer sustaining your sales funnel?